MIlan Baranyk scored for Phantoms at Manchester. 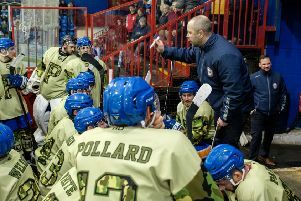 Peterborough Phantoms coach Slava Koulikov admitted his team were beaten by a moment of beauty last night. . . although he was also left to reflect on another moment of controversy. The city men went down 3-2 to Manchester Phoenix in an English Premier League clash that was eventually settled in overtime. It meant Phantoms collected another welcome point at the Deeside Leisure Centre to maintain their second position in the standings. Koulikov was full of praise for a high-class, sudden-death clincher from Phoenix import Michael Satek which earned the hosts the extra point. But he was also left frustrated by a potentially match-changing call to disallow a Phantoms effort from the returning Darius Pliskauskas with seconds of middle session remaining. Referee Stephen Matthews washed out the Lithuanian international’s strike after ruling fellow import Milan Baranyk had interfered with Manchester netminder Stephen Fone. It was a decision with which Koulikov didn’t agree and one which had a major bearing on a contest they led 2-1 at the time. Koulikov said: “I will need to have a look at the video to be sure, but on first viewing I didn’t see any reason for the goal to not stand. “There was minimal contact between Milan and the netminder, but it was outside of the crease. “I’m not going to say that decision is the reason why we didn’t win the game, but it definitely had a bearing on it. “A two-goal lead at that point would have made it very tough for Manchester to come back whereas 2-1 is always a slippery scoreline. “In the end they got level and then won the extra point with a beautiful goal in OT. I have to give Manchester a lot of credit for the way they are picking up results while so short-staffed. Phantoms had already claimed home and away successes over the Phoenix this season, but they briefly trailed to a powerplay effort from Ben Wood in the first period last night. But they soon turned a deficit into an advantage with two goals in the space of 21 seconds. Baranyk levelled before Ales Padelek quickly followed suit in putting the puck in the net. There was no further change to the scoreline until Nico Aaltonen hauled the hosts level with just over seven minutes of regulation time remaining before Satek settled the issue 71 seconds into overtime. Phantoms return to action on Thursday (November 26) when they make a re-arranged trip to Bracknell for the first of two games in three days against the Bees. The Berkshire side then provide the opposition at Planet Ice on Saturday (November 28, 7pm).